I thought you might be ready for another spiritual boost by Haruna Ishola and his Apala Group. I have been using public transport a lot during the past months of snow and other phenomena which I - wishfully perhaps - considered to be nasty memories from the past. And I have found that the at times absurdly prolonged waiting can be reduced considerably by the auditory consumption of some apala music by our revered Alhadji. I haven't been able to make any reliable measurements, but it may even beat the flying of time when having fun! I am still trying to figure out how this time manipulation works. Of course there is the force of repetition and the highly refined use of syncopation. And on this album, which I suspect is from the early 1980s, maestro Haruna adds another magical ingredient: echo. This album by Franco and his O.K. Jazz was released by Polygram Kenya in 1986 as the third volume of a series entitled "Fifteen Years Ago". And for this album the title is not completely inappropriate. As far as I can deduce, only "Où est le sérieux?" (with Sam Mangwana) is definitely from a much later date than 1971. It seems wise to be cautious in dating songs of this period, as it is not always clear which was the 'original' release (the Congolese or the French) and as tracks were (seemingly) not always released in the order in which they were recorded. The album is, like the others in this series (Volume one can be found in this earlier post), a collection of tracks previously released only on singles. And as such there are some real 'marvels of the past' to be enjoyed on these volumes. 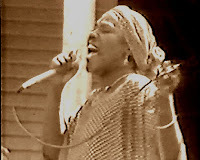 Such as Franco's version of "Maseke Ya Meme", a song by his brother Bavon Marie Marie which must have provoked some emotion with Franco, who felt at least partly responsible for the death of his younger brother, as the car accident in which Bavon was killed was a result of the fury after a row between the brothers. Franco sings the song together with Youlou Mabiala (photo on the right), who also played a part in the events leading to the accident. Bavon had accused him too of getting too friendly with his girlfriend. As the first volume was centered around Vicky Longomba, in this third volume the focus is more on Youlou. Vicky is, however, present in "Makambo Maneno", although in a modest role. His presence suggests, by the way, that the track is from an earlier date than the others. Youlou contributes two composition to this album*, and is vocally present in all of the tracks except the 'misplaced' "Où est le sérieux?". His singing is great, and I especially like the combination with Michel Boyibanda in Boyibanda's "Osabote Jean Jean" and "Andu Wa Andura". But my favourite track is composed by Armando Brazzos. "Sukola Motema Olinga" is one of those (many) special tracks that you can listen to again and again and still discover new details. Particularly the interplay between Franco's lead and the rhythm (Brazzos) and bass never seems to sound the same. Note the way in which Franco leaves the last word in this track to Brazzos. * the first of these, "Sentence" (or "Sentence Ya"), is credited to Kwamy on Sonodisc CD 36603. Given that Kwamy is either almost inaudible or simply not singing in this track, and that Youlou has very clearly the lead role, I think the credits on this album are more likely to be correct. This is really the video that started my research into the (im)possibilities of sharing longer (than just under 11 minutes) videos. Another (and for now the last) of the reposts. In this case of Thomas Mapfumo's "Marehwarehwa" (originally posted here). The full 24+ minute track is split into 5 RAR files, plus a zip file with PAR's. EDIT: I don't mind it others use my posts, but would appreciate it - as a matter of common decency and respect - if they would at least inform me of this use. As they haven't, I feel free to re-use their efforts. In this case I am referring to the re-use of the video shared in this post by symbolkid on the Black Man Land blog. 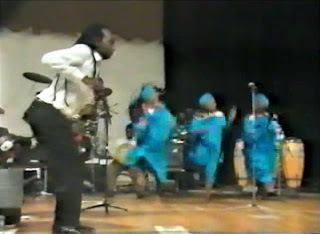 Thomas Mapfumo - Marehwarehwa (1994) from symbolkid on Vimeo. 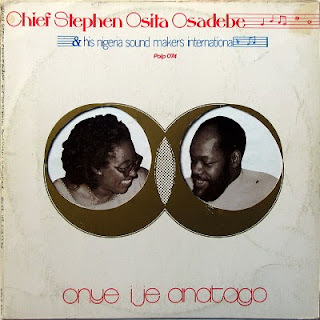 I can just imagine the scene: Chief Stephen Osita Osadebe and his Nigeria Sound Makers International have been invited to entertain at the Freedom Social Club. All the right people are there. Osadebe, himself a native from Anambra State and born in Atani, is politely greeting the functionaries of the club, who in return, at the mention of their name and the recognition of their importance, discreetly - but nevertheless sufficiently open - hand the national artist the equivalent of a month's salary of one of the waiters who are inobtrusively serving the gathered dignitaries. The music is pleasant and all the guests are happy and content. Later in the evening, there is room for a dance, - a merengue even. Osadebe style, of course. So the ladies can show off their dancing skills without making a fool of themselves. Halfway down the song changes pace, and even the elder members of the club can't help themselves and are bending their knees at the rhythm. Even the royal visitors invited for this special occasion are on the dancefloor now. Osadebe points at the guitarist who carefully guides the by now wildly dancing mass into a state of musical bliss. Unless they are ingeniously trying to get to a socialist utopia via the great Kladderadatsch*, the labelling of the Zimbabwean regime as 'marxist' seems somewhat outdated. What started as a struggle for freedom, independence and 'justice for all', has evolved into oppression, depression and misery. Hopes and ideals have faded into desillusion and despair. Such ideals have certainly played a part in the life of Simon Chimbetu. 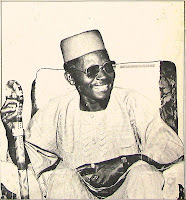 Having been active in the struggle in the 1970s (although not as a fighter), he turned to a career in music after independence had been won. In the late 1970s he and his brother Naison had been performing with John Chibadura's Sungura Boys. In the revolutionary vigour that came with independance they founded their own band and named it the Marxist Brothers. Like other Zimbabwean artists the liberation struggle had shaped Simon's view of life. I gather that many of his songs have politically 'coloured' themes, - although others prefer to think this was only a matter of perception. He went through a very dark period in the late 1980s/early 1990s. After he and his brother had split up in 1988, the following year he was sentenced to four years imprisonment for his involvement in the theft of a car. While in prison, his wife left him. He managed to bounce back, however, and he continued his musical career with his new band, the Dendera Kings, named (according to this article) "after the Mozambican camp which the Chimbetu brothers called home during the revolutionary struggle against white settlers in the 1970s". Dendera was also the name of the farm which the Chimbetu brothers obtained in 2000. They were on the receiving end of ZANU-PF's land reform, which caused so much controversy both in and outside Zimbabwe. Simon was again under attack a few years later, when it was reported that he wasn't paying his farm workers. In general, his support and defense of Mugabe's policies gradually led to Chimbetu falling out of sync with his audience. Simon Chimbetu died under somewhat mysterious circumstances at the age of 49 on August 14, 2005, in Harare. A more indepth study of his lyrics can be found in this study, and a rather chaotic entry in the wikipedia can be found here. 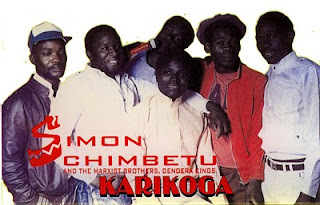 As an illustration of his work I am including two albums: the Marxist Brothers's first album "Mwana weDangwe" from 1983 and the cassette version of the 1995 album "Karikoga". EDIT June 11, 2013: The links to the cassettes have been updated. This is a first on this blog: I am going to repeat an earlier posting! It's really not as bad as it sounds; I am just repeating two EP's by Paul Mwanga I posted earlier, in order to present them in a broader setting. 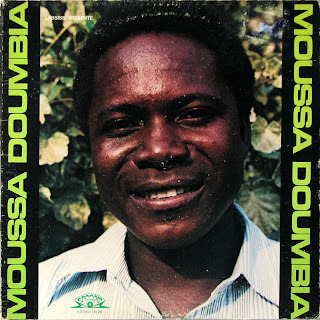 So instead of two EP's this time I am posting five extended play records by this legend of Congolese music. The three extra EP's feature Mwanga with his Affeinta Jazz, so in total there are now sixteen tracks with Affeinta Jazz and four with Jazz Venus. 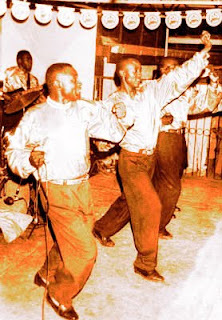 Musicians of the latter band, reportedly founded by Mwanga, also played in Jazz Mango, which in the early 1960s acted as a backing band to Leon Bukasa. 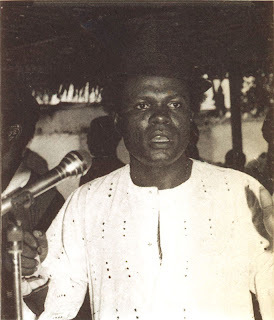 As I mentioned in my earlier post, my favourite tracks by Mwanga are the ones with kikongo rhythms: "Mambu Ku Ntuala", "Butuka Ku Kongo", "Kongo Mpaka Diena", "Ngudi Wabebeas Mwana", "Mambu Ngola Mena", "Putulukesu Zengele Ndombe", "Tuwizana" and "Ma Bulu Mankatu Lutima". I can't get enough of these songs, which to me are shining examples of the blending of traditional rhythms into modern music. His fellow musicians often refer to him as just "Diabaté". But if you search on the internet you'll soon find that Abdoulaye Diabaté is the subject - or victim even - of a lot of confusion. So let me get a few things straight. He doesn't play the kora, but does have an above average talent as a drummer. He does have a brother, but isn't the brother of Kassemady. He does not live in Canada or the US, but in Koutiala in the Sikasso region of Mali. 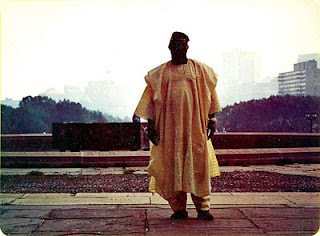 This Abdoulaye Diabaté (subject of earlier posts, here and here) is the man who drove audiences wild* at the Biennales in the 1980s. I first met him at the 1988 Biennale, which was the last of the old style Biennales. I even interviewed him and Mamadou Diakité, chef d'orchestre of the Kéné Star, the regional orchestra of Sikasso. He struck me then as a somewhat shy person, who left all the talking to Mamadou Diakité. I met him again just over a year later, when he was playing with his own Koule Star in Markala, near Segou. Surrounded by local (female) fans, he was far more relaxed and obviously in his element. He even allowed me to make some recordings, which I may post at a later date. Both at the Biennale and at the Markala concert he played most of the tracks of this cassette. The track "Louanze", about the poor legal position of tenants, even became a nationwide hit. 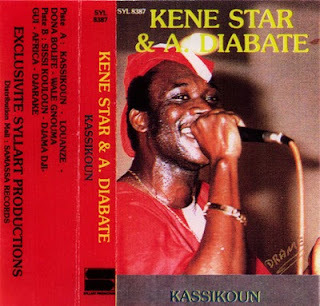 This is certainly not my favourite album by Abdoulaye Diabaté. 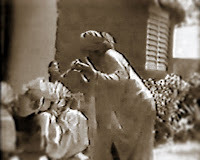 It was recorded in Abidjan, and that is always a huge handicap for Malian musicians. It usually means arrogant recording engineers imposing their technical gadgets on overwhelmed artists. In that respect the lp, which was later released for the western market, is in my opinion slightly worse than the cassette. So I am including both the cassette and the lp, so you can make up your own mind. 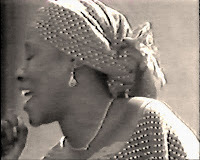 As a bonus I am adding this video, from a concert in 1988 in Bamako. The track is actually from the cassette which I posted earlier. EDIT March 14, 2016: the link to the cassette version has been renewed! 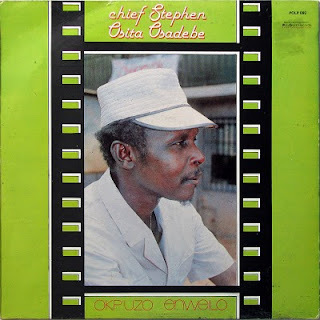 I have been listening a lot to "Sound Time", a CD containing re-mastered masterpieces by the - unfortunately late - consistent highlife king, Chief Stephen Osita Osadebe. And although the collection is recommendable and very enjoyable when travelling to work, I can't help feeling it is also a bit 'overpimped'. So I have rummaged about in my archives, and have dusted off some more of the (many) lp's I bought at Stern's when they were still a little corner shop in Whitfield Street, and were desperate to get rid of the flood of Osadebe albums clogging their stocks. I was glad to come to the rescue at the time, and actually even regret not buying more. Here is one from 1982, in an authentic, underpimped state. 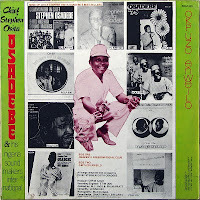 "Onye Ije Anatago" is one the many albums with just two tracks. Tracks that gradually evolve. A musical voyage with Osadebe as our tour guide, drawing our attention to the sights. My favourite part of this album is the break after 11 minutes on side B, - but not because of the drums, but rather for the almost obvious - but complete - change of rhythm.